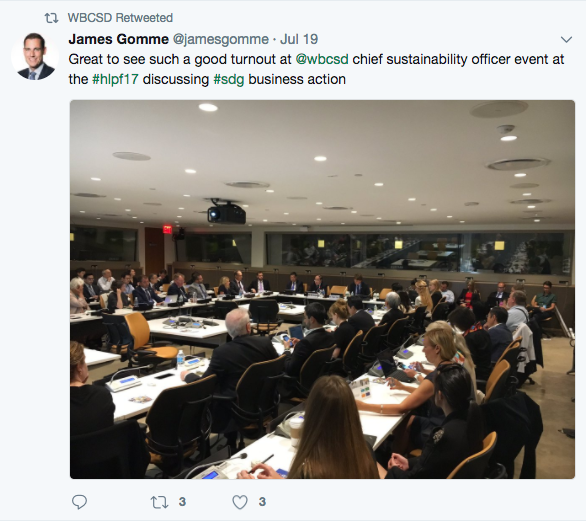 ESG discusses the SDG Business Dashboard at the United Nations with leading companies. During the UN’s High Level Political Forum in New York, the SDG Business Forum convened over 1,000 business leaders and global business networks committed to work together to advance the 2030 Agenda. The convening of the forum by global business networks showcased examples of companies advancing the Sustainable Development Goals (SDGs). Earth Security Group brought a concise and practical message: It is in the interest of companies to go beyond philanthropy and CSR approaches to the SDGs and consider addressing those issues that will affect their license to operate in the next years. 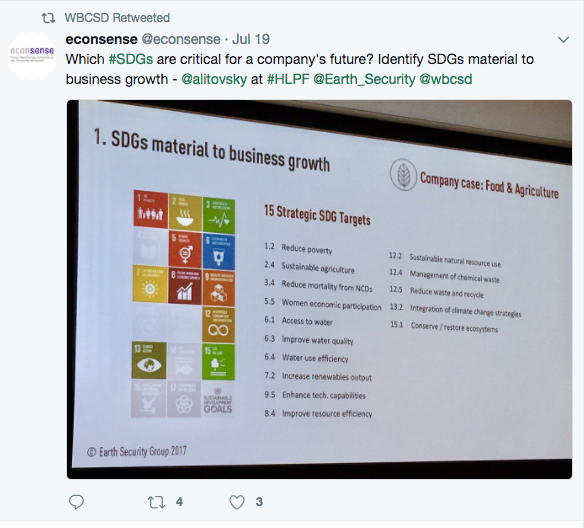 ESG presented its SDG Business Dashboard in a discussion panel with leading global companies, at a meeting organised by the World Business Council for Sustainable Development (WBCSD) for Chief Sustainability Officers of leading multinationals present at the UN. The presentation put forward practical examples of how companies can embed SDGs that are vital to their growth and competitiveness and collaborate with governments through “business diplomacy” to co-create the policy conditions needed for inclusive growth. ESG previewed the 2017 Earth Security Report to be launched in New York on 19th September.